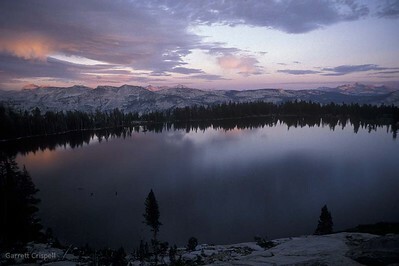 May Lake is one of six backcountry camps John Muir established, years ago, to host the Washington D.C. contingent. 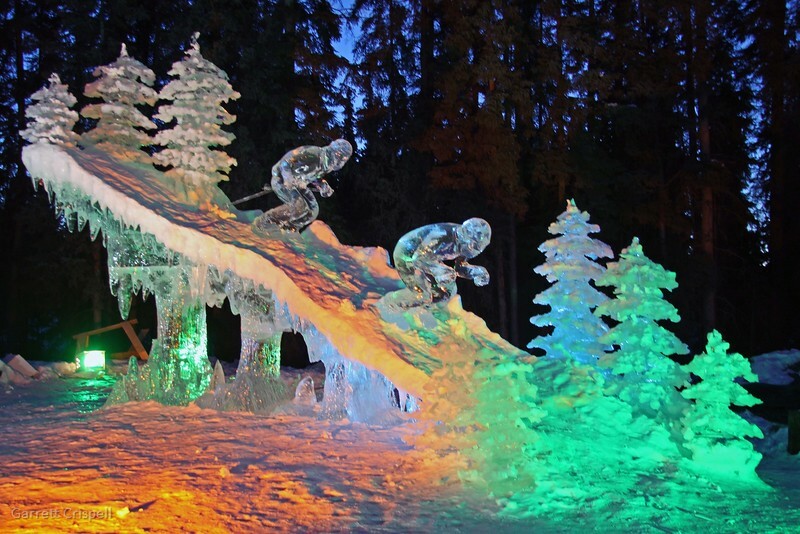 The contingent was impressed by Muirs' efforts and presentation enough to designate Yosemite a National Park. 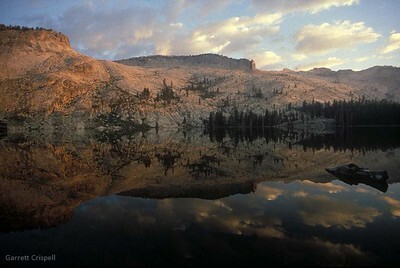 Backcountry Yosemite, mid-August at May Lake. 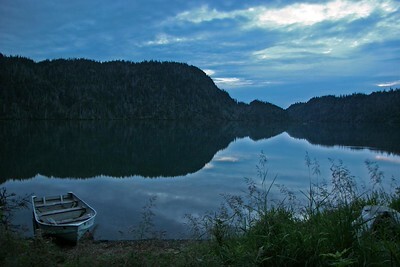 Serene setting, the quiet spoke volumes. 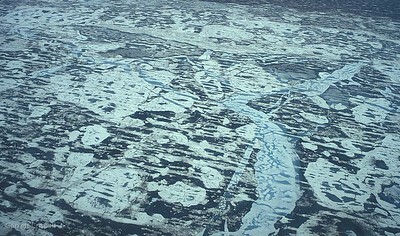 Late-June Arctic Ocean break-up near the Canning River confluence with the Arctic Ocean, west of Kaktovik, Alaska. The cleaner blue ice indicates ice that has been around for more than a year, impurities have started "filtering" out of the ice. Bottle Nose Dolphin, Tursiops Truncatus. Bottlenose Dolphins are the most common and well-known type of dolphin. Bottlenose dolphins are found inhabiting warm seas worldwide. Bottlenose dolphins are grey in colour and grow between 2 and 4 meters long. These dolphins typically stay in groups from 15 to 2,000 in number. Dolphins are thought to be one of the more intelligent animals of the mammal world, along with bigger primates and humans. Dolphins are thought to communicate to other dolphins through a series of clicking sounds. Bottlenose dolphins generally have a good relationship with humans and due to their intelligence, bottlenose dolphins have been trained by military forces for tasks such as locating sea mines or detecting and marking enemy divers. In some areas the bottlenose dolphins have been known to help the local fishermen by driving fish towards the fishermen and then eating the fish that escape the nets. 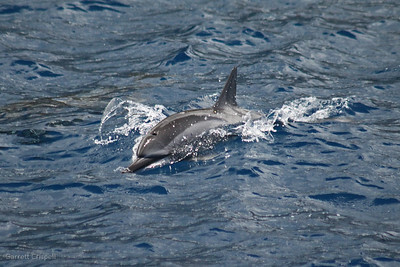 Some interactions with humans however are harmful to the dolphins as people hunt bottlenose dolphins for food, and dolphins are often killed by accident when there is mass tuna fishing. Bottlenose dolphins are generally known to have a calm and playful temperament, particularly around humans. 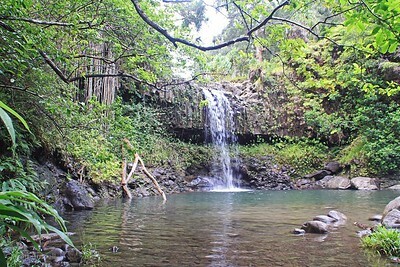 Hawaii is a wonderful destination... This Bottle-nose provided several minutes of viewing pleasure. Sea Turtle, Chelonioidea. Sea turtles are found in all of the major oceans and smaller seas with the exception of the Arctic Circle as it is generally too cold for sea turtles as they tend to prefer more temperate waters. The bigger species of sea turtle are found more in the Southern Hemisphere in the tropical, warmer waters. There are 7 known species of sea turtle today; the green sea turtle is found all over the world but there are larger populations of the green sea turtle in the Atlantic and Pacific oceans. Although sea turtles spend their time out at sea, sea turtles always go back to the same beach to breed and often travel huge distances to get there. The female sea turtles bury their eggs in the sand on the beach where they were born. After laying her eggs the female sea turtle will return to the sea, leaving her eggs to hatch in their nest under the sand. When the baby sea turtles hatch, they walk straight into the ocean and begin their life at sea. Today, all of the 7 different species of sea turtle are under threat from extinction. The decline in the world's sea turtle population is thought to be mainly due to the sea turtles being caught accidentally by large fishing boats and due to the fact that humans will often take the eggs of the sea turtle to eat as a delicacy. Numerous conservation projects are underway all over the world in order to try to protect and preserve the sea turtle populations that remain. Sea turtles tend to eat sea grasses, shrimp, crabs, fish and jellyfish, depending on what the sea turtle can find and catch. Sea turtles have the remarkable ability to travel hundreds (in some cases thousands) of miles in order to get between their feeding grounds and their nesting grounds. Most female sea turtles return to the same beach to nest every time and will often emerge from the water just meters away from where they nested the time before. Sea turtles will often be able to breed for around 30 years with some species of sea turtle not being able to do so until they are 50 years old. Adult sea turtle have few natural predators besides large sharks and being caught up in human fishing nets meaning that they can live to more than 80 years old. Around 90% of baby sea turtles are eaten by smaller predators like raccoons, sea birds and large fish. 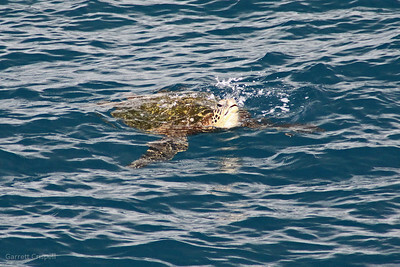 This rather large Green Turtle seemed to have nary a care in the world... 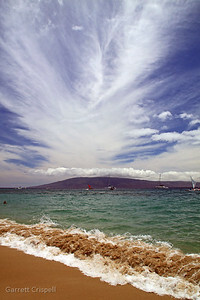 The image was captured during a beautiful boat cruise around the Maui, Hawaii area. Stellar Sea Lion, Otariidae. Today there are seven different species of sea lion found in waters around the world, These are the Steller sea lion which is also known as the northern sea lion as it is found in the North Pacific Ocean, and the Steller sea lion is the largest sea lion species. 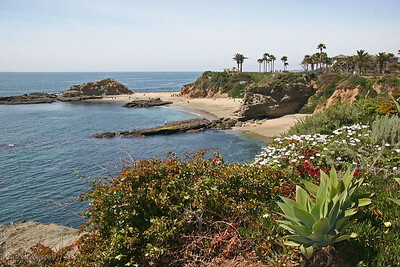 The sea lion generally lives in coastal areas where there is a good food supply and land close by for the sea lion to have a rest from swimming and hunting in the water. The sea lion has 4 flippers which the sea lion is able to turn around when on solid ground, allowing the sea lion to walk on land. Stellar Sea Lions are noisy, odoriferous, and constantly jostling for position. 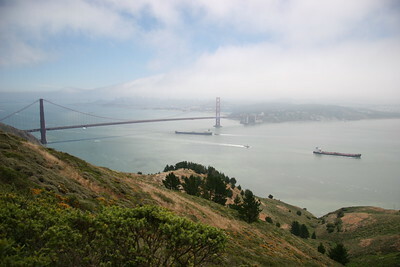 What a perfect place for "king of the hill." 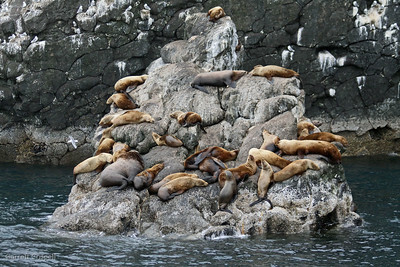 These seals are located in Kenai Fjords National Park, near Seward, Alaska. 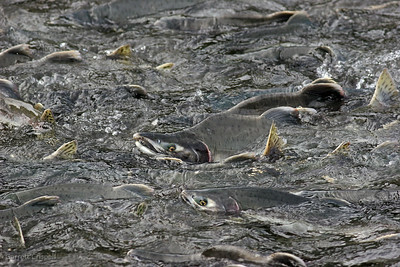 Salmon on the Run. 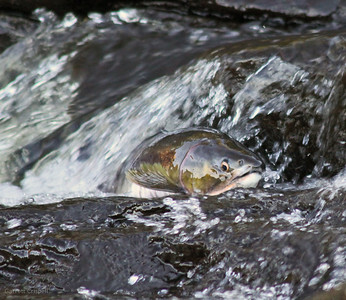 There doesn't seem to be much water for this salmon to navigate, in fact, this unit took a wrong turn and had to turn around. Black Bear, Ursus americanus. Despite their name, Black Bears can range in color from black to dark red or brown and can even be a lighter tan in certain areas. They have short thick fur covering their heavily built body and have a pointed muzzle, small eyes and larger and more pointed ears than their Brown Bear relatives. Along with being a great deal smaller, there are a number of other notable differences between the two species including the Black Bear lacking the distinctive shoulder hump of their larger cousins. They also have shorter legs and claws which makes the Black Bear a much more agile climber than the Brown Bear. Like all bear species though, the Black Bear has an excellent sense of smell which is used to detect food and less developed hearing and sight, due to their relatively small ears and eyes. This young Black Bear just snagged another "Pinkie" for some additional nutrition. 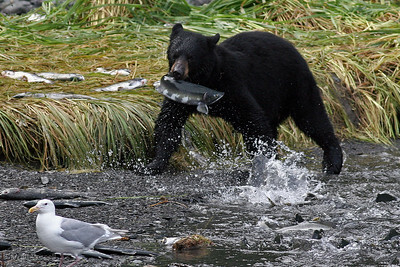 If the salmon run is plentiful enough the bear can be somewhat picky about what it will eat of the salmon. The bear will drop the salmon on the ground, step on its stomach, forcing the roe out whereupon the bear enjoys some "pinkie" caviar. Valdez, Alaska. 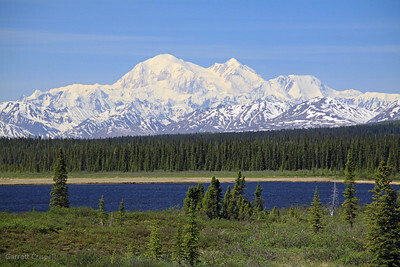 Summertime viewing of Denali is a great experience, especially when it isn't raining... The Mountain is missing from view approximately 80% of the time, making it a challenge to see, let alone shoot. This image was taken just south of Cantwell. Maui Cloud I The weather patterns around Hawaii provide for some appealing scenes. Tranquil Waterfall This waterfall and pool would make any backyard the envy of your neighborhood. 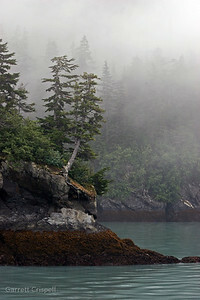 Trees in the Shroud Prince William Sound, Valdez, Alaska. 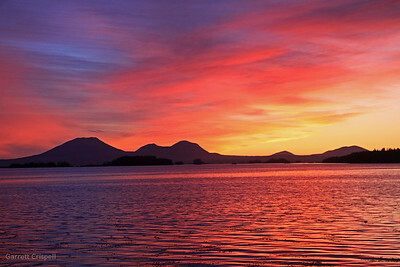 The Sound offers many viewing opportunities; animals, fish, glaciers, glacier calving, waterfalls, foliage. This area was effected by the Exxon spill back in 1989, some residual exists. 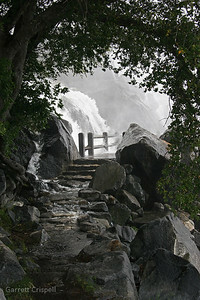 Hetch Hetchy I Spring runoff generated enough water for the waterfall to cascade over the walkway. Found out my new camera backpack was very water resistant. 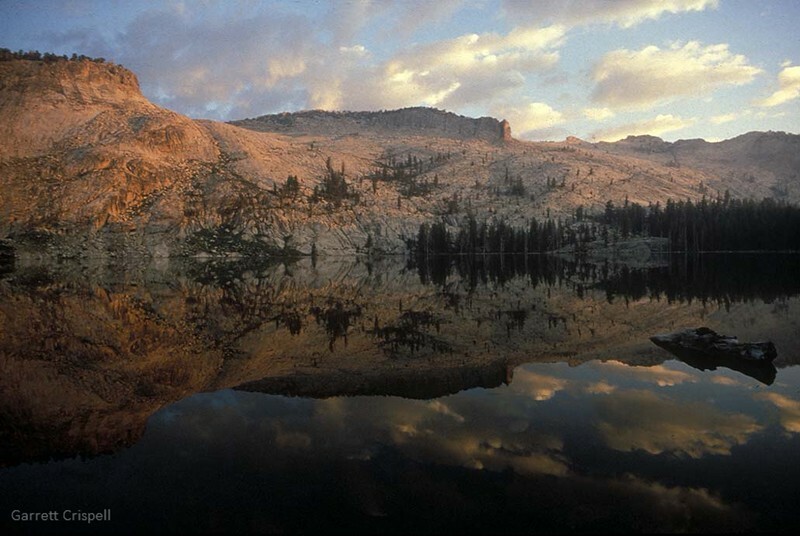 There's talk about indicating a desire to drain Hetch Hetchy Reservoir and return the valley to its once pristine status; it has been described as having been more beautiful than Yosemite National Park. Kenai Fjords National Park Seward, Alaska. Inactive volcano, Mt. Edgecombe provides the background for this vibrant sunset. Spanning an hour plus, the color palette was phenomenal with more than a hundred people stopping to snap a few and leave. The water color effect was a tad special. 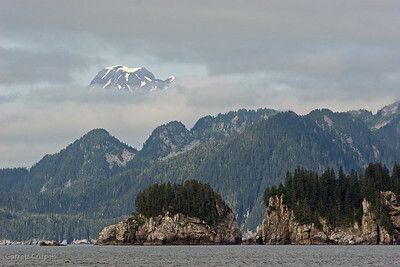 The Alaska Marine Highway provides many opportunities to enjoy the geography of Alaska. 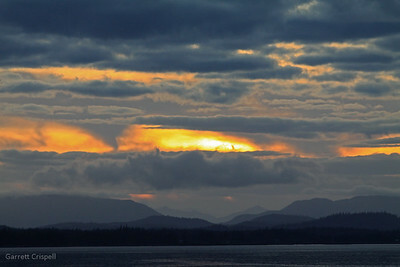 During a two week business trip through southeast Alaska, this image was captured north of Ketchikan, while sailing the Inland Passage. 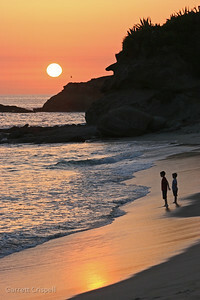 Setting up a sunset shot at Witch's Rock, two young boys meandered into the frame. After several minutes waiting for them to stop karate kicking and messing around they turned to watch the ocean, allowing for this image. I believe it to be rather poignant how "big bro" seems to be subconsciously protecting his little brother. Mid-fall provided this vibrant sunset. 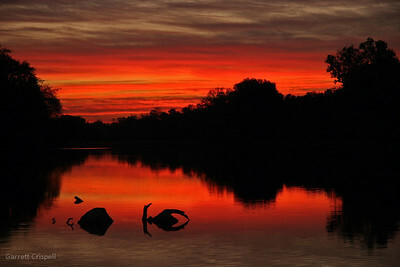 The rice fields burning and urban smog combined to create this evening glow along the American River. Driving to photograph a sunset, I missed my exit and ended up here; good trade. 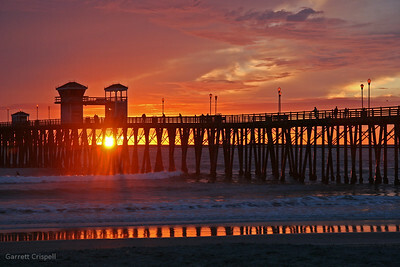 Camp Pendleton is located nearby.